Hospitality – So you could get a job working as a waiter/waitress or bartender. There are plenty of cafés and restaurants thriving in Worcester’s city centre, so I’m sure they could use the staff. Or if you’re a night owl, there are numerous bars and clubs that you could try out! Retail – Along the same sort of lines, there are many shops to be found in the High Street and beyond. Not all of them are always looking for staff, but stay alert, because advertisements usually pop up around similar times annually; the Christmas period, the summer holidays and September time, after employers lose some of their staff off to university. Top tip – getting a Temp position is usually a good place to start, both for retail experience and to get your foot in the door, especially if you want to see how easily you can balance study and work! Promotional Work – This could be for local companies; clubs and gyms are usually good for this kind of flexible work. Or you could go bigger and find work with large-scale businesses such as Spotify and Amazon, doing promotional events and activities in return for lump sum payments. University – The University has a wonderful ‘Earn as You Learn‘ scheme which operates, not only alongside the Students Union, but also across departments, meaning you may find some ad-hoc work, related to your course. Examples include working as a Student Blogger, Student Ambassador and much more. Volunteering – If you’re looking for something to boost your CV and fill your time, but would rather do this with less commitment, and for the benefit of others, then this may be your option! 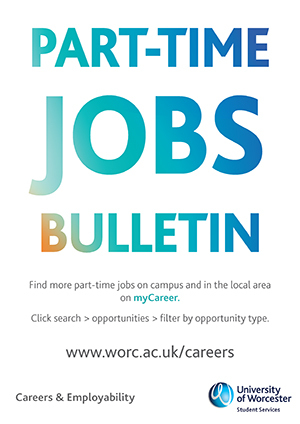 The University also uploads a ‘Part Time Jobs Bulletin‘ regularly, showing vacancies both inside and out of the university. No matter what kind of vacancy you are after, be sure to look well in advance and be prompt with applications and responses to job offers, even if you aren’t accepting. This post is not intended to push you to get a job, or deter you with the potential drawbacks of one – only you know how much you can take on and you must be realistic. After all, your degree should be your number 1 priority; it’s what you’re paying to do. You earn your own money – it’s nice to have a bit of excess cash outside of paying for rent, food and other necessary expenses! The opportunity to improve your money management skills – budgeting, bill paying, etc. You can improve your customer service skills. You improve your time management. The perfect solution to boredom! You will have to balance your studies alongside work, and any other commitments. You may be working for minimum wage, dependent on the employer. You may miss out on some parts of your social calendar – you don’t want to miss out on your best friend’s birthday because you forgot to book it off! I’m not going to pretend it’s an easy task to manage, but if you’re willing to put in the effort to have healthy work-life-uni balance, then it’s more than worth it! Final advice: always keep your CV up-to-date and keep one handy, where possible!